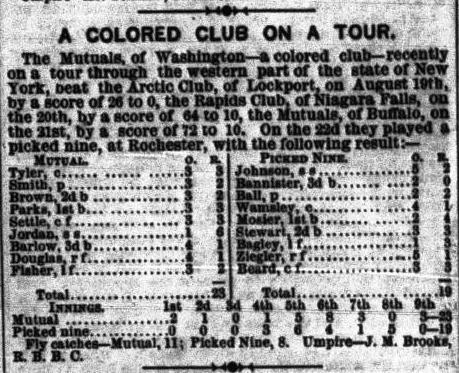 In the fall of 1870 the Washington Mutuals Base Ball Club, of which Charles Douglass was a member, toured “through the western part of the state of New York” and promptly defeated the Arctic Club of Lockport, the Rapids Club of Niagara Falls, the Mutuals of Buffalo, and a “picked nine” at Rochester, – the city in which Charles was born and raised by his father, Frederick, and mother, Anna Murray. This box score from The New York Clipper shows Charles (his last name misspelled) playing right field and batting eighth in a game the Mutuals won 23-19. Charles, the youngest son of Frederick Douglass, accounted for one run and made four outs. This entry was posted on May 9, 2012, 3:53 am and is filed under Uncategorized. You can follow any responses to this entry through RSS 2.0. You can leave a response, or trackback from your own site.